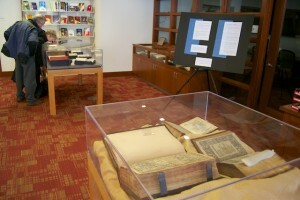 The Christoph Keller, Jr. Library of The General Theological Seminary opened an exhibit on March 25, “Thomas Cromwell and the English Bible,” drawn from the library’s Special Collections. It will run through June 2015. Other items on view include earlier Biblical translations that helped bring about the Protestant Reformation and images from the Tudor court, including Anne Boleyn and Cardinal Wolsey–both of whom figure largely in Hilary Mantel’s much-acclaimed historical novels, Wolf Hall and Bring Up the Bodies. This exhibit coincides with the Broadway run of the two-part play, Wolf Hall, based on Mantel’s novels about power politics in Tudor England. The staged version, at the Winter Garden Theater, is a production of the Royal Shakespeare Company. Also, on Easter Sunday, April 5, PBS stations broadcast the first episode of the six-part BBC dramatization of Wolf Hall. The Christoph Keller, Jr. Library is open free to the public Monday through Friday, 10 a.m. – 5 p.m. Visitors may use the campus entrance at 440 West 21st Street, in Chelsea, one block from the High Line.